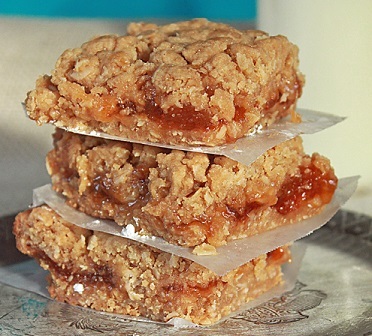 These delicious Apricot Bars taste great with a cup of coffee or tea as a snack as well as an easy-to-make after dinner dessert. If stored tightly covered, they will keep for four or five days. This dessert recipe is a favorite with a lot of people at the restaurant when they want a dessert but do not want anything too filling or "heavy-duty." I actually got this dessert recipe from my mother-in-law as part of my "marriage training manual." My husband is addicted to this dessert. He apparently grew up on them. He tells me the topping in combination with the apricot jam is what "makes it." 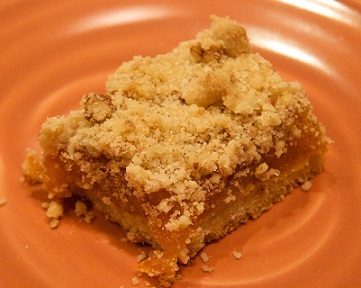 You can use this same recipe to make Peach Bars simply by using peach jam instead of apricot jam. Preparation time: 15 minutes. Makes 2 dozen. Enjoy your dessert recipe and the company of those you share them with! 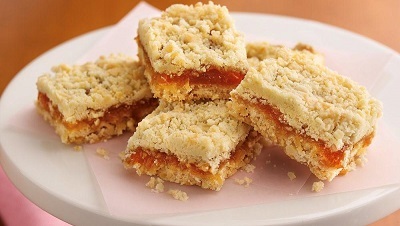 They are a delicious snack or after dinner dessert. 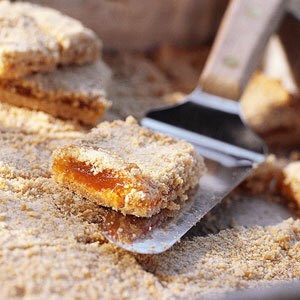 The apricot is a native of China and has been cultivated for over 4,000 years.